Maybe not an encouraging name for a slot, or maybe just a very honest name - Miss Fortune is a Halloween-themed slot from Playtech. It comes packed with the typical cartoon introduction, smart graphics and some unique features you would expect from this developer. Miss Fortune slot has 5 reels, 3 rows and 25 paylines, so nothing new there, but is it as dire for the player as the name suggests? There are Wilds on all reels, non-multiplying and scatters too, as well as a bonus scatter on reels 1, 3 and 5 in the form of a baby green dragon. Miss Fortune greets the in-play cumulative events with a seductive giggle as she waves her wand from the left of the screen. The graphics are quite good, but the spooky element to this game is lost in the cuteness of the characters in the game. The Wilds pay 200x stake for 5-of-a-kind (5OAK) and of the standard symbols Miss Fortune herself pays 20x stake for 5OAK right down to the lowest card letters 10, J, Q which pay 4x stake. There are two events for 'near misses' and the first concerns wilds. When one lands and doesn't form a win, Miss Fortune will collect it and add it to a meter above the left reels. Once 3 are collected, a respin will occur and she will distribute the 3 Wilds over the reels, hopefully forming a decent win. Should you get the normal disappointment of 2 scatters anywhere on the first 4 reels and the third doesn't land, Miss Fortune will add a free spin on to a meter above the right reels. There is no limit to this and may help considerably when you consider the format of the free games. Three scatters anywhere earn you 7 free games which cannot be retriggered. You will also get any saved extra free spins Miss Fortune has added to the meter. 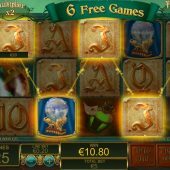 The free games start with a 2x multiplier and every non-winning free spin adds 1 to this, up to a maximum of 6x multiplier. So the more spins you start with, the higher the chance of achieving the higher multipliers. 3 dragon scatters 1, 3 and 5 offer this. You are faced with 10 lockers and need to pick the one hiding the stupid little dragon as soon as possible. This is because you get 10 picks from 10 separate banks of 10 lockers. Should you get all 10 dragons you will be awarded with 1500x stake, just one 10x stake and 2 earns you 20x stake on a scale of prizes. Given that if this was 'random' you would be hitting odds of 10 to the power of 10 (ten billion to 1) to get maximum 1500x stake so yeah, we all agree the award is pre-selected!